CHATHAM-- For two summers, the Chatham A’s’ Andrew Miller (North Carolina) has shut down the best college players in the country with remarkable ease. In a league know nationwide for its terrific pitching, Miller was the best of the best. He posted a perfect 6-0 record, which put him in a tie for second-most wins in the league, behind teammate Jared Hughes. In 49 innings pitched, Miller struck out 66 batters, good for fifth best league-wide, and posted an almost invisible 1.65 ERA. Early in the season, Chatham General Manager Charlie Thoms predicted his team’s success would hinge on the performance of its lefty ace, who many predict could be the number one player taken overall in next year’s MLB draft. With his performance this year, Miller lived up to the lofty expectations, helping his team advance to the East Division playoffs in the process. 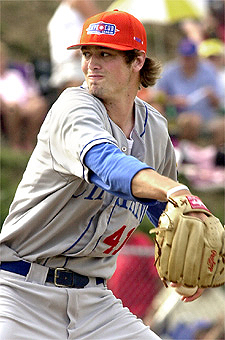 Following his first summer on the Cape in 2004, Miller was named the Cape League’s No. 1 Major League prospect by Baseball America. He re-joined the A’s again in 2005 after a strong sophomore campaign in Chapel Hill. The Gainesville, Fla., native went 8-4 with a 2.98 ERA and 104 strikeouts for the Tar Heels this spring, before becoming part of a talented Chatham pitching staff that included Robert Woodard, Jared Hughes and Derrick Lutz. Miller has a smooth wind-up and delivery and also throws incredibly hard. Miller’s first start of the season came on June 21, the first official day of summer, against the Hyannis Mets. The sophomore wasted no time establishing himself as a premier pitcher, hurling seven shutout innings and scattering three hits in a 98-pitch effort. For the second consecutive year, Miller was named a CCBL All-Star. His appearance in last year’s midsummer classic was a performance few spectators will forget: he entered the game in the fifth inning and fanned all three batters he faced on just 15 pitches. In this year’s All-Star Game, following fellow A’s Hughes, Woodard and Lutz to the mound, he struck out two of the three West All-Stars he faced. After pitching brilliantly all summer, Miller took the mound in Game 1 of the East Division playoffs against the Orleans Cardinals. Although he did not get credit for the win, he was spectacular, pitching eight innings and striking out 10. Miller was almost unhittable as the Cards did not get their first base runner until the fourth inning and handed the ball over in the ninth with his team leading by a run. The A’s would come back to win Game 1 in the 11th inning, but would ultimately lose the series to the Cards. In addition to being named outstanding pitcher, Miller shared the B.F.C Whitehouse Outstanding Pitcher Award with hard-throwing right-hander Tim Norton of Falmouth for best prospect.